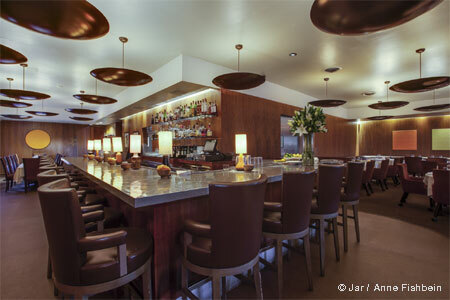 A modern tavern in Santa Monica with colorful décor and creative New American fare. : The Independence, a modern tavern near Santa Monica's Third Street Promenade, inhabits a huge space with colorful, graffiti-style murals. 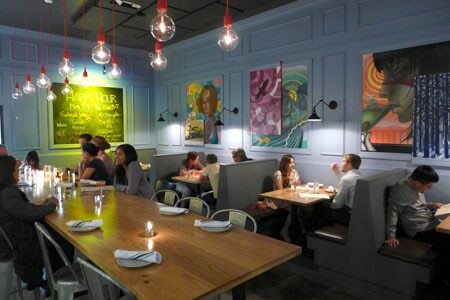 Booths and a communal table occupy one side, followed by a long bar flanked by high-top tables, then another area of regular tables. Concrete floors and lots of glass mean the decibel levels can get high. The attractive menu of New American fare provides many reasons for a return visit. Kick things off with starters of blue crab and shrimp ceviche, Japanese snapper crudo or kale chopped salad. We like the variety of textures in the dish of uni, peas and burrata with Israeli couscous and croutons. Moving on to mains, we'd recommend the excellent rack of lamb with Thai red curry rub, smoked eggplant purée and coconut over the wild local halibut (a fish that's sometimes challenging to work with). The Angus burger with French onions, Gruyère and herb aïoli is a popular choice. For dessert, the kitchen may prepare a rosewater panna cotta. There's a limited wine list plus several local craft beers on tap and a few Belgian offerings by the bottle. Mixologist Vincenzo Marianella (Copa d'Oro) presents non-alcoholic "mocktails" as well as tempting tipples such as the Wolfskill, composed of Bourbon, mezcal, rhubarb liqueur, elderflower liqueur and Jerry Thomas Bitters. Happy hour (Tues.-Fri. 3 p.m.-6 p.m.) offers $5 featured cocktails, house wine, house spirits and select drafts along with snacks.